I love creating light and shade, gaudy and gloom with the dazzlingly colourful glass palette spread out on my light box. As with 14th century glass painters, I mostly use mouth-blown glass and fuse black Glass Painters’ Stain to it by kiln-firing. Walking in the glorious Gloucestershire countryside and in particular the astounding Cotswold scenery surrounding my home is largely what inspires my windows, door panels and free hanging panels. 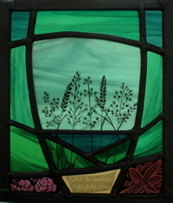 Stained Glass artists such as Christopher Whall, Laurence Whistler and Deborah Lowe are also a constant guide and inspiration. Each panel I make is unique. As with all stained glass, its luminosity and character changes with the light providing an enduring fascination. Stained glass is an age old medium which has changed little over the centuries. The timeless quality of this craft and its ability to uplift and draw people is a great incentive to me.